Arthritis in cats is more common than we think. Unfortunately, cats hide their pain very well, making it hard to tell when they are suffering the pain of arthritis. We at Coventry Animal Hospital feel that arthritis is missed so often in cats that we have decided to dedicate a blog specifically to our feline friends! Arthritis (also known as degenerative joint disease) is caused by the breakdown of cartilage in the joints. This leads to remodeling of the bones in the joints, abnormal contact between the bones in the joints, inflammation and pain. What is the cause of arthritis? Previous damage to a joint: any joint that has sustained an injury (such as fractures or torn ligaments) will be prone to developing arthritis in the future. Abnormal forces on a joint: If the bones of a joint are structured abnormally (as in cases of hip dysplasia) the bones will contact each other abnormally and lead to arthritis. Aging: Unfortunately, cartilage tends to break down as cats age and can lead to the development of arthritis. How can I tell if my cat has arthritis? Cats are very good at hiding pain and signs of arthritis, therefore, you need to watch for subtle signs. 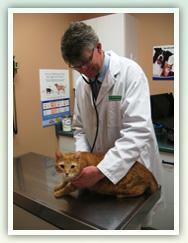 Arthritis is often diagnosed on a thorough physical examination with your veterinarian. Sometimes your veterinarian may need to take X-rays to confirm arthritis and rule out other conditions. Remember, arthritis is a chronic pain which means that your cat will not show obvious signs like crying out, even when in severe pain. It is important to take your senior cat to your veterinarian at least annually so that she may evaluate your cat for these subtle signs. 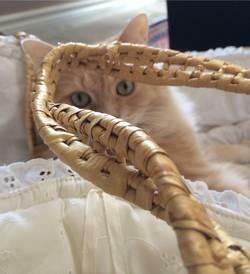 Since cats hide pain so well, a trial of pain medication is often required to actually see the difference the arthritis pain is making on your cat’s quality of life. If you notice any of the signs as listed above, contact your veterinarian to discuss the possibility of arthritis in your cat.